Belli Momenti was reccomended to us as ‘the best wedding planning service in Corfu’, which coming from our Corfiot friends we considered quite the endorsement. When we met Aris we explained to him that we were looking for something a little out of the ordinary and from the first meeting he was completely in sync with our ideas and style. We wanted an elegant boutique wedding, with an edge. In a secluded setting, with plenty of Corfiot charm, while still retaining the elegance and beauty of nature. After many expeditions to various parts of the island we decided upon Kaiser’s Throne, the first time Belli Momenti had arranged a wedding there. It had just the right balance of everything we wanted. Perfect views, seclusion, nature, stunning architecture. As a location, and with the addition of Belli Momenti decorations, Kaisers Throne was completely atmospherical with the hundreds of candles along the turrets and old walls of the area. The ceremony itself was conducted by Aris, with the vows suggested by himself and modified by us. We kept the ceremony short and sweet, and after the main bulk of the photos we sat down to eat. The table was prepared exactly how we had envisaged – black crystal glasses, grey candles lit amongst vast sprays of lilac flowers, themselves sitting atop enormous vintage candelabra. It had the perfect balance of charm and rustics. The meal itself surprised us with a constant flow of food – we had ordered four courses but instead had about five hours worth of food delivered in smaller mezze style. The sun had gone down over the island while we ate, and the hundreds of candles really gave the area an ethereal atmosphere. Aris was on hand throughout the evening, checking everything was going according to plan and to ensure we had ample wine!! We would reccomend Belli Momenti to anybody who wishes to have their wedding in Corfu – Aris took all the stress and hassle away from the experience. All that was left for us to do was the fun stuff, and for that Aris was worth his weight in gold. ...more than a typical Wedding Planner...your friend! The right person in the right time! In the best time of your life! Aris grew up in the beautiful island of Corfu and has explored all the island’s hidden and virgin landscapes by his motorbike. After wandering all over Greece and completing his studies in Communication and Public Relations and in Health Services, he came back to Corfu and started a passionate involvement with the Wedding Planning. 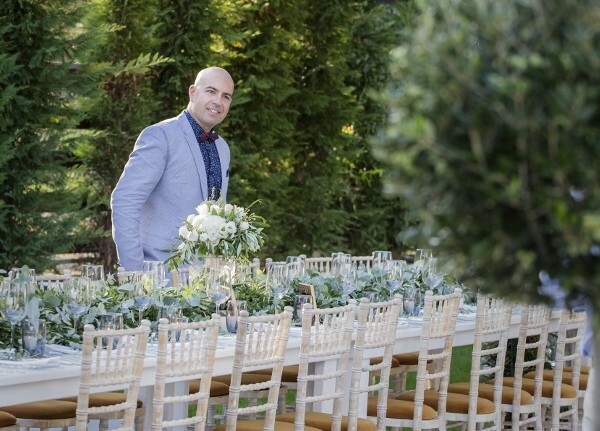 Ηis inspiration became a specialization, so he decided to live forever in the island of his heart, dedicate precious time in his family and the one thing he loves the most, the Planning and Styling of bespoke Weddings. Also, his great knowledge of Catering services and his broad experience in Coordination make him a unique professional to work with. Aris has an advanced individual style that helps him think forward! However his most important skill is to stand by you, hear your thoughts and desires, always with a big smile full of energy, to fulfill your expectations for a shimmering wedding come true!